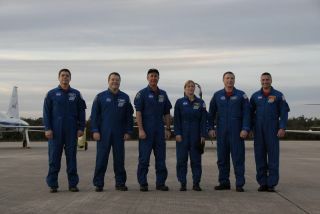 The six-astronaut crew of shuttle Endeavour's STS-130 mission pose for a photo at NASA's Shuttle Landing Facility after arriving Jan. 18, 2010 for prelaunch training. Liftoff is set for Feb. 7. Thesix astronauts preparing to fly into orbit aboard NASA?s shuttle Endeavour nextmonth arrived at their Florida launch site Monday for some final trainingsessions as engineers work to replace vital hoses for their cargo ? a new spacestation room. Shuttlecommander George Zamka and his crew landed their supersonic T-38 jets on runwayat NASA?s Kennedy Space Center in Cape Canaveral, Fla., to begin a days-longrehearsal of shuttleblastoffs and landings. Endeavour is slated to launch toward theInternational Space Station on Feb. 7 at 4:39 a.m. EST (0939 GMT). ?We just flew over Endeavour over the pad here and she looks beautiful,? said astronautStephen Robinson, a mission specialist on the space mission, from the tarmac. ?We can?t wait to borrow her for a couple of weeks.? Endeavourwill fly a planned 13-day mission to deliver the new Tranquility moduleand a seven-window observation portal ? called the Cupola - to the spacestation. Three spacewalks are planned for the mission. Tranquilityis a cylindrical module covered with connecting ports and will house life supportand exercise gear, as well as the Cupola window portal for the $100 billionspace station. The module is destined to be attached to the left side of thestation?s core Unity connecting module. Earlierthis month, the module?s vital ammonia cooling system hoses failed a standardprelaunch pressure test. Two of the hoses burst at lower pressures than wouldbe required to keep Tranquility?s electronics gear from overheating. Thehoses are about 14 feet (4.2 meters) long ? longer than typical hoses on thespace station?s exterior ? so engineers have been working to build new ones bycobbling together shorter hoses into acceptable replacements. Testsof the new hoses have gone well at NASA?s Marshall Spaceflight Center in Huntsville,Ala., where they were built, and NASA plans to deliver them to the KennedySpace Center in the first week of February, just before launch. NASAspokesperson Allard Beutel at the Florida spaceport told SPACE.com that thehoses ? four in all ? will be stowed inside a storage locked in Endeavour?smiddeck for the two-day trip to the space station. TheTranquilitymodule, attached Cupola and other station parts were delivered to Endeavourat the seaside Launch Pad 39A at KSC before dawn on Monday morning, NASA officialssaid. Endeavour?sSTS-130 mission is the first of five finalshuttle missions planned in 2010 as NASA prepares to mothball itsthree-orbiter fleet later this fall. NASA?sspace shuttle replacement, the Orion spacecraft and their Ares I rockets, arenot expected to begin launching astronauts to orbit until 2015 at the earliest. Endeavour?splanned predawn launch on Sunday, Feb. 7 is expected to be NASA?s lastnight liftoff of an orbiter after nearly 30 years of shuttle flight. ?Endeavourhas been a great vehicle,? Zamka told reporters from the tarmac Monday. ?And itsounds like it?s in great shape. ?